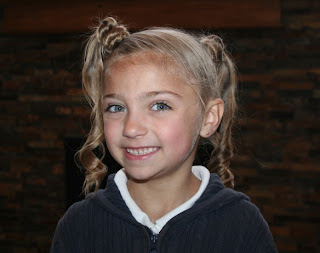 This fun hairstyle has turned out to be on of my personal favorites, and gets so many comments that you absolutely must try it out on your daughters (I will be adding it to my Favorite’s tab as well)! This style is one of my secret weapon styles from my old hairstyle photo album that I wrote about a few months back. It happens to be a personal favorite of my #3 daughter as well (pictured below)… my girls call this ‘do the “Tri-Bun-Onies”! Items Needed: Six large hair elastics, spray bottle, rat-tail comb, curling or flat iron (for subtle curls). 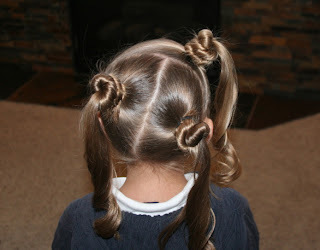 If you enjoyed this hairstyle, comment back and let me know!